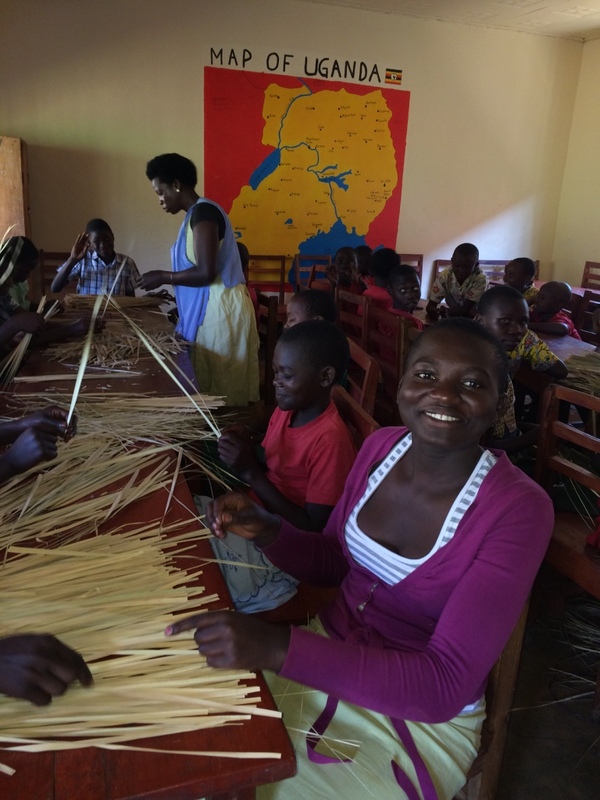 On Saturday May 21st 2016 I attended the Children of Bududa’s (CoB) basket weaving and handcrafted purses course. The process of making baskets is both a complex and useful skill. The skills that they are learning can be used to gain an income. After one broken needle, a couple pricks to the finger, and some tight pulling on the ribbon I realised how hard it was to make a basket. I spent the first half of the class observing how the young students were weaving baskets. I looked on as the students picked up their half-finished baskets and began their work. The students would pick up some bukedo, which is the stick-like material that is grouped as one, in order to make a basket. To ensure that the basket stays together, the students picked a colored ribbon, and they sewed it into the bukedo. They made sure to tighten it so that their basket would be sturdy upon completion. They use an imbiso, which is the Lumisaaba word for a needle, to sew their ribbon to their basket. The students picked a specific design, using both yellow and red ribbon, which is intricate and requires a lot of concentration. After half an hour of observing the CoB students hard at work, I asked Florence, the basket-weaving teacher, for her permission to make my very own basket. Florence helped me start a basket. However, one half hour later, my bukedo was starting to look like the base of a basket. After one broken needle, a couple pricks to the finger, and some tight pulling on the ribbon I realized how hard it was to make. My basket is looking good now but I will need to work on making sure the ribbon does not crumple up because then the finished product will not be as appealing. Anne-Sophie has since continued the basket in recent weeks so that we can have a complex pattern done by two weavers! I was happy to be given this opportunity. In attending such an important class during the CoB Saturday programming, I learned the difficulty of weaving handmade pots, basins, and hanging baskets. These students are learning a life skill that is an integral part of their culture and a valuable trade that they can potentially use to make an income. The Children of Bududa students really appreciate the opportunities that the program has afforded them. They are also grateful to the program sponsors, who are helping them learn this valuable skill. I am looking forward to returning to the basket weaving class to finish her shishipo[i] during the next CoB programming day.